We were working in a downstairs home office on a windy day. We both heard a couple of muffled thumps, and assumed that they were objects, outdoors, being blown around. A minute or so later, Jana wandered upstairs and began barking. There’s (unfortunately) nothing unusual in that. But this was not her “there’s a deer in the yard” bark; nor was it her “I’m scared” bark or her “I need to get that toy that rolled under the sofa.” It wasn’t even her “I can’t make the dog door work” bark. This bark had a note of alarm or uncertainty. It very clearly told us she needed help with something. Deni went upstairs. Seconds later, her voice (with that same “I need assistance” note) wafted down to me. I went upstairs. A bird had entered the house through an open window and was standing on the living room floor, a bit stunned. When Deni had gotten upstairs, Jana had been standing only foot or so away from the motionless bird, barking. She had not touched the bird. She had not chased the bird. She had called us. While Deni held onto Jana and Wylie, who’d finally showed up to investigate, I gently took the bird outside. After a few moments, the bird flew off, unharmed. What was going on? 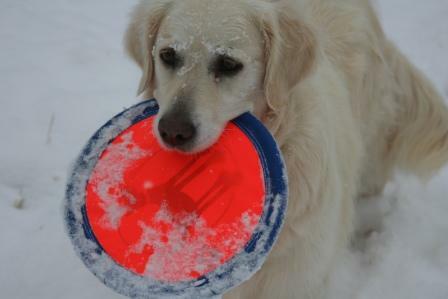 Jana’s a retriever, and she has a very high prey drive. She loves to chase birds outside (and cats and squirrels and minivans). She often shows interest in dead birds she finds on our walks. But she had not chased the bird. She could easily have grabbed and killed, even eaten, the bird. We were busy downstairs and would not have noticed until it was too late to intervene. All that we know about canine instinct would say that was the natural course of action. But she hadn’t done that. What she did was bark — call for help — and stand there, watching, while we helped the bird.